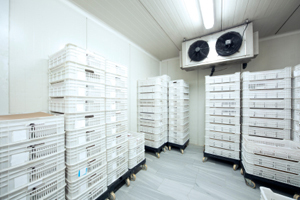 Refrigeration system design is one of the most important aspects of a retail, wholesale or food storage facility design and yet is often the least understood. No system has more impact on energy usage or maintaining product quality than the refrigeration system. In a typical facility, the refrigeration systems will account for up to 80% of the facility’s energy costs yet the lighting and HVAC systems are normally the primary focus of energy concerns. Additionally, a refrigeration system failure could potentially result in the loss of hundreds of thousands of dollars worth of product. Maintain the correct temperatures as required by the FDA Food Code to prevent bacteria from forming, to ensure freshness, and to maintain an appetizing appearance. Maintain the optimum humidity level for the product being stored to minimize water loss and extend product life. Systems should be capable of modulating to accommodate a wide range of load conditions. Tailor the design to the specific location. Factors such as extreme summer ambient temperatures, altitude above sea level, and proximity to the seashore can affect system operation dramatically. Build in sufficient flexibility for the future. Changes in the FDA Food Code, refrigerants, and merchandizing have led the retail industry to average a major renovation every 5 years. Balance energy efficiency with energy and capital costs. The preferred payback period for the additional costs associated with increased energy efficiency should be 3 years or less. The end result should be a system that is user friendly. The layout should provide adequate service access, be easy to upgrade, easy to expand, and should be compatible with the end users service capabilities. Keep the big picture in mind. Consider the available space and the ease of routing for refrigerant piping. Address any noise or ventilation concerns. Comply with all local codes and the end user’s refrigerant criteria. Take advantage of any available rebate programs. Take advantage of waste heat recovery where possible. The preferred use would be for hot water heat reclaim if there is sufficient need for hot water. The refrigeration systems will generate the most waste heat during the summer months when sensible space heating loads are virtually non-existent. Always keep in mind the latest technology. What may have not made sense previously may be appropriate today. Conversely, avoid premature obsolescence. Need to remodel or do a refrigerant change out? No problem. BD's engineers are fully qualified to visit your site, perform a thorough survey of the existing systems, make recommendations, and design a solution to keep your facility up and running throughout the conversion. We will even prepare a phasing plan to guide the other trades through the process; ensuring a smooth change over and minimizing change orders. Will your OEM do that? BD Engineering can perform a final walk through and generate a punchlist to ensure a quality installation.